Scotland defeated Samoa 19-16 in their showdown at Pittodrie in Aberdeen on Saturday thanks to a last-minute penalty from 22-year-old fly-half Ruaridh Jackson. The Glasgow playmaker, winning only his second cap, stepped up to slot the winning points with time up, securing back-to-back wins for Andy Robinson's side after last weekend's much-celebrated victory over South Africa at Murrayfield. Samoa contributed a great deal at the snow-dusted home of Aberdeen Football Club, taking an early lead through Hawke's Bay scrum-half Kahn Fotuali'i's try and providing their traditional blend of pace and power throughout a tightly-contested second-half. Ospreys winger Nikki Walker helped himself to Scotland's try and the Man of the Match honour, with Dan Parks kicking the conversion as well as two penalties and a drop-goal before making way for Jackson with 20 minutes to go. The rock hard surface and crisp winter air promised an expansive game but Scotland took an old school approach in the opening minutes. A little South African belligerence apparently rubbed off on the home side as a powerful maul drew a penalty deep inside the Samoan 22, Parks opening the scoring from the kicking tee. Samoa grew into the game steadily and snatched the lead with a brilliantly orchestrated try, although they were aided by some poor Scottish defence. Fotuali'i's break from a scrum was followed up by some nimble passing between centres George Pisi and Seilala Mapusua, Pisi's effective grubber finding his midfield parter before a simple inside ball put Fotuali'i over untouched. Sale fullback Paul Williams converted but Scotland were immediately back on the front foot as Kelly Brown and John Barclay combined to charge down a lazy clearance from Tasesa Lavea. Mapusua mopped up but lost the ball forward, with Scotland striking from the scrum. Their front-row rock solid, Lawson and Parks sparked a training ground move as the ball was fed behind the decoy-running Graeme Morrison for Walker to power over under the posts. Parks added the extras but missed a simple shot at goal after Euan Murray and Ross Ford made a mess of the Samoan scrum. The Cardiff Blues fly-half continued a wobbly few minutes with a misguided grubber and some flighty handling, but extended the Scottish lead to six points with his second penalty, which was secured by good work from Allan Jacobsen, the prop winning his 50th cap. With half-time looming Williams landed his first penalty of the game to close the gap to three, leaving Scotland pondering a difficult start to the second period. Their fears were realised from the kick-off as a mix-up between Richies Gray and Vernon led to Williams levelling the scores with his second penalty only 90 seconds after the restart. Scotland redoubled their efforts with a good break from Morrison and strong link play between the forwards and backs, their momentum halted only by a cynical boot from a ruck by Kane Thompson. Parks pushed his effort wide but was on the mark with a drop-goal to restore the home side's narrow lead on 52 minutes. Samoa cranked up their power game after falling behind. Williams broke well and brought Alesana Tuilagi and Cencus Johnston into play along the touchline, with Scotland scrambling to hold them at bay. David Lemi went close late in the movement but Scottish hands prevented the quick release. Williams kicked the penalty from under the sticks, but it was three points that the Scots were happy to concede. Andy Robinson rolled the dice with a raft of replacements, notably taking off parks in favour of Jackson, and there was an immediate response. 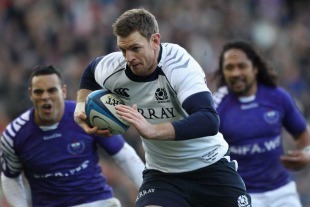 Morrison stepped three players to spark a length of the field break, offloading to substitute scrum-half Mike Blair. The former skipper kept the move alive with a pop pass to Walker but a moment's indecision from Barclay as the ball was whipped wide allowed a mass of Samoan shirts to close out the danger. Both sides scrapped for territory in the closing moments and it was the unfortunate duty of replacement Samoan lock Joe Tekori to concede the game-winning penalty. The look on the face of the Castres second-rower spoke volumes as Jackson lined up the kick and the youngster held his nerve to ensure that Scotland had more to celebrate this weekend.